The Division of Student Affairs supports the academic mission of UC Irvine. Our work in the areas of Auxiliary Services, Student Life & Leadership and Wellness, Health & Counseling Services prepares students to develop self-knowledge, to interact positively with others, and to promote justice-based change in the world. 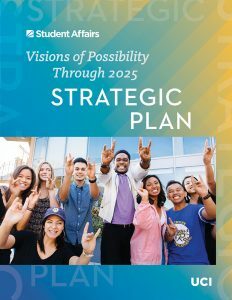 The Student Affairs Strategic Plan is built on top of the UCI Strategic Plan and represents a guiding framework for the Division of Student Affairs’ future activities.